Well, it wasn't quite that bad. But more seemed to go wrong than right during our recent mini-trip to the Cote d'Azur and hinterlands. big amusement park. I was interested in the sea creatures, not the rides. I had a VIP visitor's pass from Nice which was supposed to include entry to Marineland, but it was refused. I intended to write about Marineland for an article on the Riviera. Journalists usually get free admission if they are to give a place free publicity. Not so at Marineland where admission was 35 euros per person. For both Bob and me the equivalent of $103 to see some dolphins and seals. We passed. 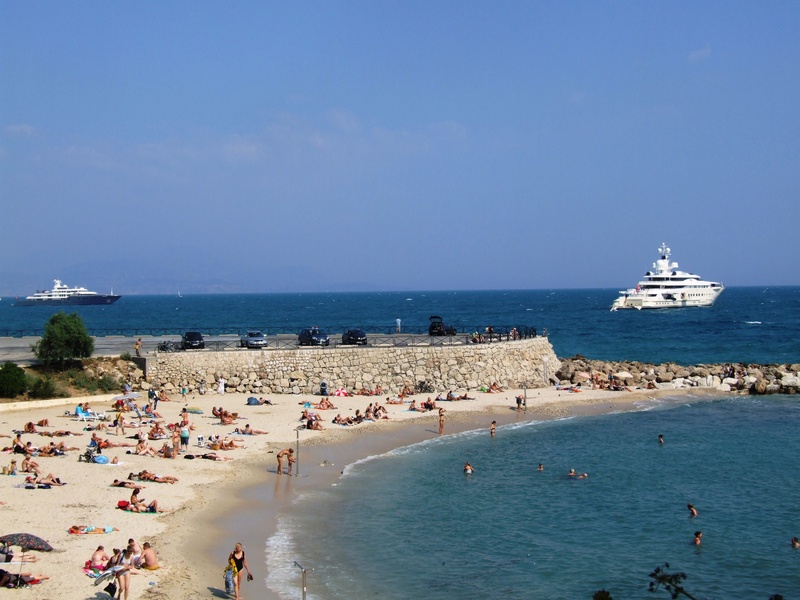 Off to downtown Antibes to visit the renowned Picasso museum. We arrived in the city at lunchtime. The tourist office told us the museum would be closed until 2 p .m. We had lunch, walked around the port admiring mega yachts, then ventured to the museum a few minutes before 2 p.m. We weren't the only ones. The long line waiting for admission was a shock. And, it barely moved. It would take at least an hour before we'd view a Picasso canvas. We departed sans Picasso and went back to the hotel where I had a wonderful swim, although the waves were gigantic for the Med. Getting in and out of the sea was a challenge, and I was knocked over by the powerful surges of water more than once. Next day was reserved for Nice. We wanted to ride the hop-on, hop-off tourist bus to see some of the attractions we had missed on a previous visit. It was a lovely ride with fascinating commentary via a headset. 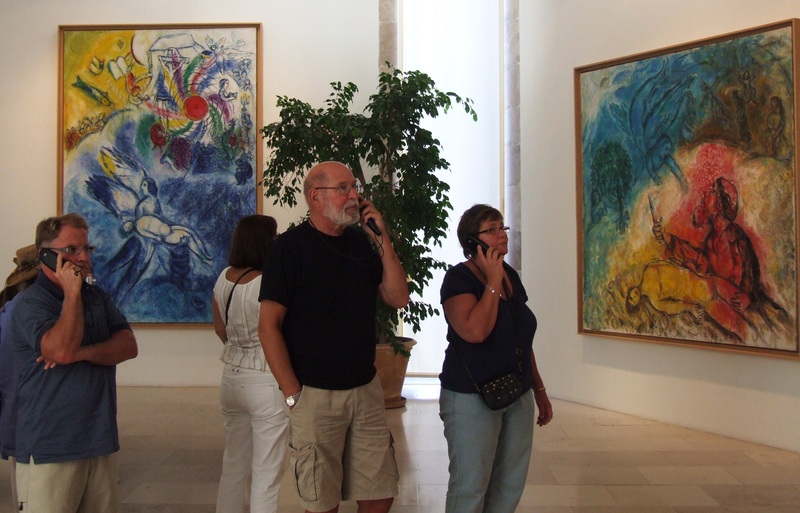 Our first stop was the Chagall museum. A plus, plus for this impressive collection of the artist's massive works depicting Biblical scenes. The city's famous Russian church was to be our next stop. As we were about to disembark from the bus, the driver announced that the church would not reopen until 2:30 p.m. It was only 12:30, and there didn't seem to be too much exciting in the neighborhood. So much for the Russian church. We stayed on the bus, completed the tour, then enjoyed walking around Nice's marvelous old town. We went back to Oliviera, a shop specializing in olive oil. They sell 18 different kinds. We had a tasting and purchased three different kinds — our trip souvenir. Day # three was a planned excursion into the hinterlands above the coast. 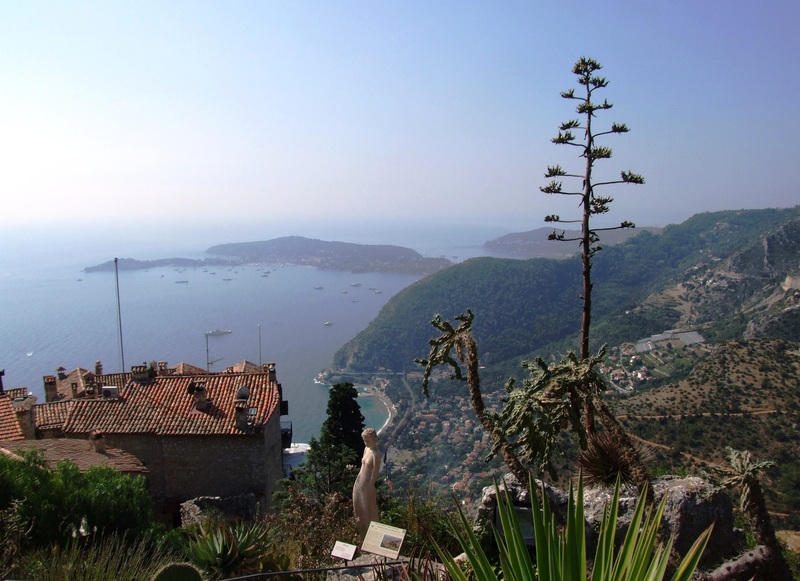 We stopped first at Eze, hiked up to the chateau ruins and exotic garden, took photos — great views of the Med below — and meandered in the cobbled streets which climb the hill and are lined with trendy, pricey boutiques. We drove on, stopping at another quaint tourist hill town, Tourrettes-sur-Loup. Maybe I've lived in Europe too long and have become jaded. To me, all these towns begin to seem alike. Our stay that night was to be at a bed-and-breakfast home I found via the Internet. We arrived at Bar-le-Loup where it was located, inquired at the tourist office about its location, and were given a map with instructions. It was way below the perched town and the route to get there seemed tricky. We wanted to quench our thirst with a beer and admire the setting before searching for our abode. Alas, the town had no cafes, no bars. Off we went, down the mountain, with several arguments en route as to where we should turn. We back tracked several times, returned to the tourist office which was of course closed, finally called the home and were given more precise instructions. At last we spotted a tiny sign to the bed-and-breakfast and made the correct turn. The road – single lane, bumpy — descended deep into a forest. No houses. Strangely, there were lots of cars coming in the opposite direction. We had to pull over and let them pass. Down, down, down we went. Where was this place? Finally another sign — another two kilometers. It was getting dark. We knew we'd have to repeat the journey to go find a restaurant for dinner. Too much, and not a good road for our Honda S2000 sports car. We bailed out. Let's just drive on to Gourdon, I suggested, a town way up the mountain where we had been on a previous trip. It has an incredible restaurant, Le Nid d'Aigle, (Eagle's Nest) on the edge of a cliff, a spectacular setting with incredible views. We had hoped to have lunch there the next day. So, we drove up and up, curve after curve. At the edge of the town, I inquired about a hotel. There are no hotels, I learned. The nearest hotels were back down the mountain in Grasse. Would we ever find a place to sleep that night? We reversed course and drove down, luckily finding a hotel on the edge of Grasse. I had tried to make reservations at the Nid d'Aigle that day, but there was never any answer, so the first thing on the morning of day # four, I called to make a reservation. "Sorry, but we're full." Now what? No reason to drive back up the mountain if we couldn't eat at this fabulous place. I relayed our plight to our hotel owner who recommended a restaurant on the coast. Fine, I'd had enough of the hills and was ready to head back to the sea. The restaurant near Cannes in la Napoule was lovely, but expensive. I ordered a mixed fish/seafood brochette which was tasty but came with little else. Bob had the dish of the day, fish, and dessert. We each had two glasses of wine. Cost: 70 euros (about $100), and I was starving two hours later. Unfortunately most of our meals on the trip were in this category: disappointing. Enough. We had planned a five-day get-away, but as our luck had been so lousy, we decided to quit before another mishap. That being said, the Cote d'Azur is gorgeous — and we will go back. See my photos. Click on the photo in the middle column.